On arrival at Maun Airport you will be met by a representative from Safari Specialists and assisted to your light aircraft transfer to Savuti Camp in the Linyanti. Savuti Camp is situated on the Savute channel in an isolated part of the private Linyanti Concession, downstream from the Zibadjanja Lagoon, the source of the Savute and bordering Chobe National Park to the north. The Channel was dry for nearly 30 years, but recently flows again, seasonally bringing a renewed life to the area. Accommodation is in seven large walk-in tents under thatch insulating you from the extreme heat or cool throughout the seasons, including one family room with a second adjacent bedroom. Each tent is raised off the ground and faces across the currently flowing Savute Channel. The room is designed so that you face the water from the bed and the spacious bathroom is behind, including an outdoor shower. The rooms additional facilities include a ceiling fan and in room safe. From the camp’s thatched dining area and bar, a plunge pool and large viewing area with boma area extend outwards on raised wooden decks towards the Channel, frequented by hippos and other wildlife providing a wonderful view. Following breakfast and possible morning activity (flight times permitting) you will transfer to the private Jao Concession by light aircraft. Upon arrival at the airstrip you are met by a representative from Kwetsani Camp for your onwards transfer in a safari vehicle to Kwetsani Camp, where you spend the following 3 nights on a fully inclusive basis. Kwetsani Camp is in the private Jao Reserve, an area of 60 000 hectares to the west of Moremi Game Reserve, in the Okavango Delta, Botswana. The camp offers an idyllic setting on a tree island heavily wooded with palm, mangosteen and fig trees. Kwetsani Camp offers and intimate safari experience with only five lavish ‘tree house’ chalets taking a maximum of 10 guests in camp. Each tented chalet has a cool thatched roof, has an en-suite bathroom with an indoor and outdoor shower, private verandah with breathtaking delta views and is fan cooled. The main lodge is on raised decking under thatch with open vistas over an enormous floodplain that is often dotted with lechwe and wildebeest and other plains game. Kwetsani also has a small swimming pool for relaxation in the heat of the day. Kwetsani Camp offers excellent land and water activities dependant on water levels from the annual flood. Guests may be able to view wildlife on game drives in open 4×4 vehicles, mokoro excursions and walking excursions on the islands. At high water time you enjoy game drives over to the Hunda area of the concession, at low water time you stay more in the immediate area. Following breakfast and possible morning activity (flight times permitting) you will transfer to the private Kwedi Concession by light aircraft. Upon arrival at the Airstrip you are met by a representative from Vumbura Plains Camp for onwards transfer in a safari vehicle to Vumbura Plains Camp, where you spend the following 3 nights on a fully inclusive basis. Vumbura Plains is a superbly luxurious camp situated in a private concession in the extreme north of the Delta. The concession, which is leased from the neighbouring community, includes a wide variety of habitats, diverse wildlife and an enormous traversing area of 60 000 hectares (130 000 acres)The camp comprises two separate seven-roomed satellite camps (North Camp and South Camp), each camp with its own raised dining, lounge and bar area tucked beneath a canopy of cool, shady, indigenous trees and with a magnificent vista across the floodplains. A star-gazing deck with comfortable cushions protrudes into the floodplain, a place to gaze upwards, or a convivial camp fire setting. Vumbura Plains breaks all expectations, an architectural and design wonder creating a serene and stylish haven in the middle of the wilderness. Each spacious luxurious room is raised off the ground on wooden decks and each comprises a bedroom, lounge, shower and bathroom – with indoor and outdoor shower. It is open on three sides creating and open and airy atmosphere with billowing curtains between the various areas. Each room also features a plunge pool and ‘sala’ providing a comfortable area to recline and relax between game viewing activities, watching the waving grasses of the floodplain. Vumbura Plains offers both land and water activities, principally nature viewing in varied habitats in open 4×4 vehicles, nature walks, mokoro trips and boat excursions. Whilst exploring the spectacular ecology of this area, one can enjoy close-up viewing of lion, leopard, elephant, cheetah and buffalo along with all the plains game. Birding is fabulous here with immense species diversity and mind-boggling numbers. The Vumbura concessions position on the extreme north of the Okavango encompasses such a wide variety of habitats and species that it has representatives of just about every animal that occurs in the Okavango biome. 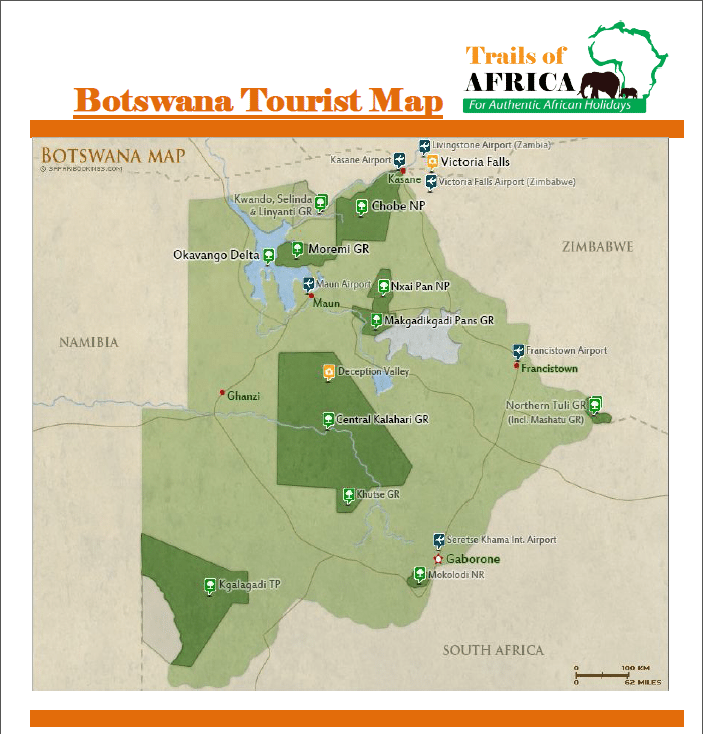 Following breakfast and possible morning activity you will transfer back to the airstrip and then fly to Maun by light aircraft for own onwards travel arrangements.